BMW 5 Series Interior, Sat Nav, Dashboard | What Car? 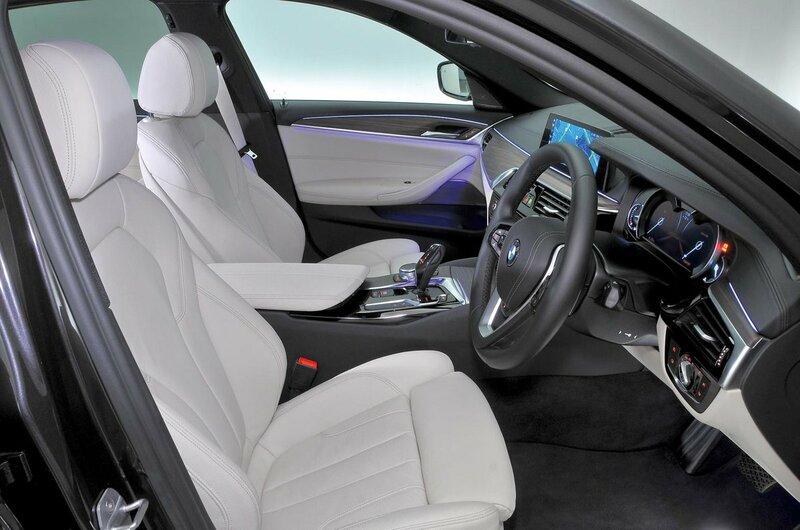 Every BMW 5 Series has a comfortable and supportive driver’s seat, with electric seat height and backrest angle adjustment as standard. The M Sport models have bigger side bolsters to hold you in place more securely when cornering quickly. There’s also plenty of steering wheel adjustment, and the driver’s seat drops lower than it does in the rival Mercedes E-Class, so you feel as though you’re sitting in, rather than on top of, the car. Fully electric seats with a memory for different driving positions are, unsurprisingly, an optional extra, but what is disappointing on a car such as this is that you also have to pay extra for lumbar adjustment. This important feature really should be standard on a luxury car at this price point, but the saving grace is it doesn't cost the earth to add. Beyond that, it's hard to fault. The dashboard is clearly laid out and all the controls are within easy reach, with physical buttons for all its major controls; that's not the case in the Audi A6, which uses a touchscreen for the climate controls that looks great but is actually needlessly distracting. The enormous, cosseting armrests, positioned perfectly either side of you, seal the deal for the 5 Series being about as comfortable on a cruise as any car out there. 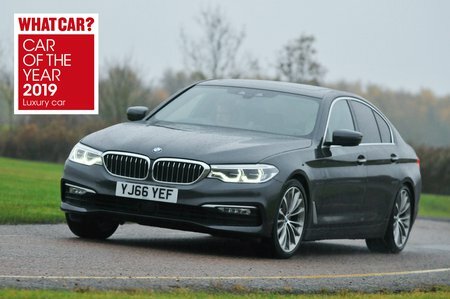 Seeing out of the 5 Series forwards and over its bonnet is no problem at all, thanks to relatively slender front pillars and the tall, wide windscreen. It’s the same story when looking sideways to the right and left at roundabouts and junctions. Getting a good view of what’s going on behind isn’t quite so easy. However, many rival saloons have similarly restricted visibility – indeed, the E-Class's thicker rear pillars make it even tougher to park – and at least every 5 Series comes with front and rear parking sensors as standard, so judging distances forwards and backwards is never a chore. A reversing camera and a self-parking system are available as optional extras on all models, as is a 360deg bird’s eye view monitor. Meanwhile, the optional head-up display can beam your speed, the speed limit of the road and even sat-nav directions onto the windscreen directly in your line of sight. At night, bright LED headlights are standard, but you can upgrade them to clever adaptive units that can shape the main beam so as to avoid dazzling oncoming traffic without resorting to dipped beam. 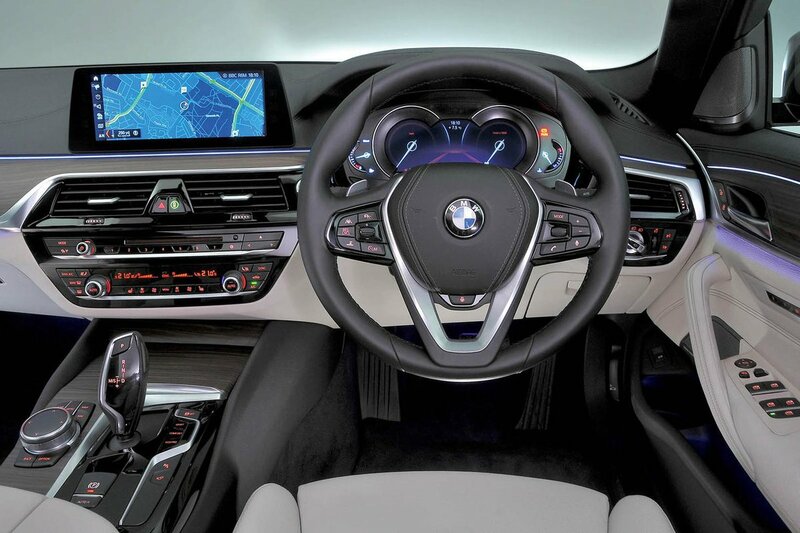 Every 5 Series comes with BMW’s range-topping Professional Multimedia system, which packs a whopping 10.25in widescreen, sat-nav, various online services, a DAB radio and even a built-in 20GB hard drive on which to store your music. It’s one of the best systems going. The screen is touch-sensitive, so you can control it by pressing it in much the same way you would an iPad. However, there’s also a rotary dial between the front seats that's surrounded by shortcut buttons. It’s so much easier (and safer) to use than the touchscreen when you’re driving, because you just twist the dial to scroll through the on-screen menus and press it down to make a selection. With a touchscreen, you must concentrate to hit the icons while your finger is being jiggled this way and that by bumps. It also helps that the menus are logical and easy to get the hang of, and the system responds quickly to inputs. On the options list you’ll find a range of increasingly powerful sound systems (the 16-speaker Harman Kardon systemwill be appreciated by music fans), a wi-fi hotspot, a digital TV and Apple CarPlay, although not Android Auto. CarPlay lets you sync up your iPhone and use some of its functions from the screen, but as with a few of BMW's services, it is subscription-based. There’s even a gesture control feature that lets you operate certain functions using mid-air hand signals; it's more gimmick than useful gadget, though. There’s no danger of you feeling short-changed when climbing into your new 5 Series. All the materials, even those lower down that you’ll rarely come into contact with, look and feel of suitably high quality, and some of the ‘metal’ trim is the real thing, although there are also some silver-coated plastics. Similarly, most buttons and switches are nicely damped, but the Audi A6's interior feels just as securely bolted together, while you could argue that the Mercedes E-Class's carries a heap more visual swagger. There are different trim inserts – including wood and gloss black – that run the length of the dashboard and around the doors, and they all look and feel upmarket. The standard ambient lighting obviously doesn’t make any difference to build quality, but it does make the interior look even more salubrious after dark.